Striker who had his second spell with the Saints during 2009-10 having made three on-loan appearances in December 2007. Began his career with Cambridge United where he played over 100 games before having loan spells with Darlington and Leyton Orient. Joined Rushden & Diamonds in the summer of 2005 and spent time on loan to Notts County whilst at Nene Park. 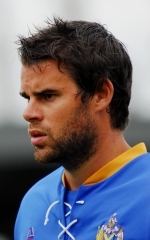 During a career that has been blighted by injury he has also played non-league football with Cambridge City. Injury again cut short his time at Clarence Park.